Remember when the Tata Nano, the world's cheapest production car, was going to conquer the world like an Indian Model T? 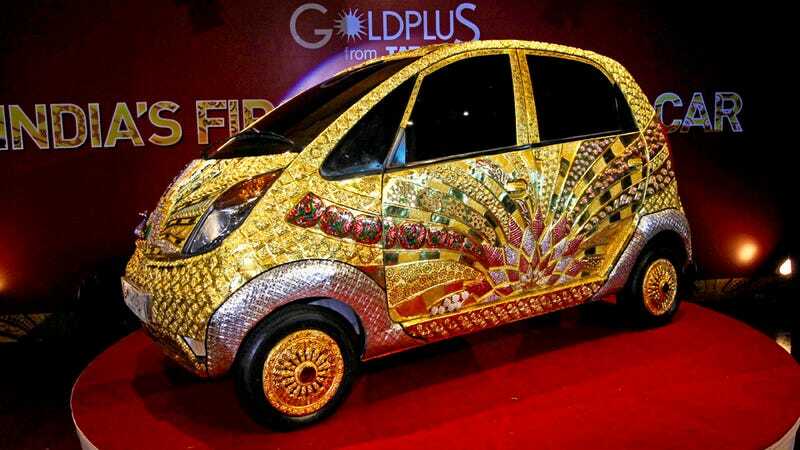 Tata's now built a gold-encrusted Nano worth $4.6 million as a publicity stunt. I don't recall Henry Ford needing to do that. Using 194 lbs. of gold, 33 lbs. of silver and enough gemstones to raise Liberace, Tata says the car will be displayed around India in its showrooms. Which could use the help, since after setting targets to sell 250,000 Nanos a year, Tata moved about 1,200 in August. Turns out that even in impoverished countries, people will pay for cars that don't catch fire, don't need "safety upgrades" and symbolize wealth rather than advertising the driver as the cheapest person on the road.